Raising basil here at Meadow Glenn has one objective: having its fragrant green leaves to add to a variety of tomato dishes. One key to better coordination of basil and tomato harvests involves my timing for setting out basil transplants. This year I started seeds on May 30 and set out the tiny plants on June 14. On Sunday (July 31) I noticed several small flowers and lots of flowerheads on one of the basil plants—just when our tomatoes are maturing in significant numbers and I’m beginning to pick basil leaves. 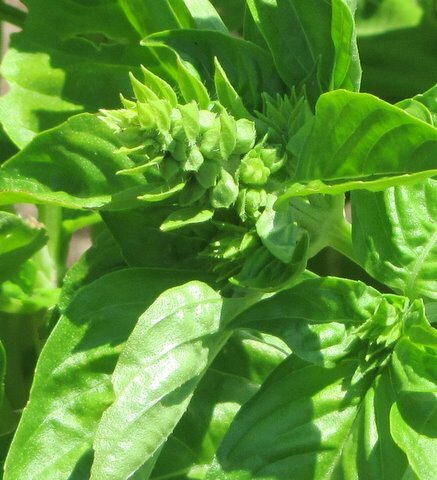 Blooming basil is not a great threat to world peace and I’ve never seen it featured at an Outback Restaurant, but I stopped what I was doing, went to get my garden shears, and cut off all the flowerheads that I could find. Why? 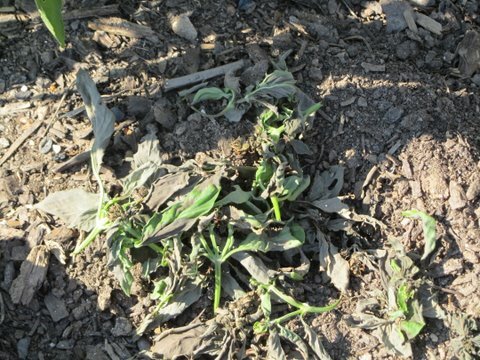 If I let the flowers go to seed, the plants will think their work for 2011 is completed and will begin to die back. When I cut back the flowers to the leaves just below, the plants will start growing more leaves—and, yes, eventually more flowerheads. Hopefully I’ll keep picking the leaves to use in tomato recipes and the plants will continue to produce leaves and won’t have time to flower again until I slow down most of my leaf picking as the tomato harvest lessens in September. If I have too many basil plants—and don’t tend to their pruning—I’ll lose the battle. If I let the plants flower and the seeds mature, they’ll drop in the fall, and I’ll have volunteers here and there next spring—but usually not where I want them. I often recognize a volunteer about a second after I’ve hoed it—a second too late to move it. If you have basil and don’t pick leaves nearly every day, keep an eye on it and pinch or cut any flowerheads as soon as you see them. Your basil will grow new leaves, and you’ll extend your herb harvest into the fall.